Toni C. Is the author of “O Hip- Hop is dead “ – The History of Hip- Hop History in Brazil, and Sabotage – The Official biography of a Brazilian Rapper, director of the Documentary “It’s all ours! Hip-Hop making history” (In Portuguese: É Tudo Nosso! O Hip Hop fazendo história) and organizer of other titles: PoucasPalavras de Renan_Inquérito, Um Sonho de Periferia, Hip-Hop a Lápis e Literatura do Oprimido. Toni C. also won the Prize Tuxauá 2010 as one of the most influential people in the Brazilian culture, and now with official biography of Sabotage, a book derived of extensive research, dedicated journalist and editing. In April 2003, when Hector Babenco’s film Carandiru was released in Brazilian theaters, the anthological scene where Sabotage kisses the “behind” of Rita Cadillac, a TV cheer leader of the audience show Chacrinha, it did not move the audience for its irreverence and spontaneity, but for the fact that it had been only three months that Sabotage had been murdered and his absence was sourly missed. Ten years later of his tragic death, the master of Hip Hop is more alive than ever, be in tributes, events, cartoons, a motion picture in production but mostly, due to his official biography, signed by Toni C. “A good place” (in Portuguese: Um bom lugar. LiteraRua, 2013 ) is his first and ultimate biography of the Brazilian rapper, and there’s extensive collaboration, including exclusive interviews from Rappin Hood, Celo X , Ganjaman , Sandrão , Heliao and Mano Brown, amongst others. 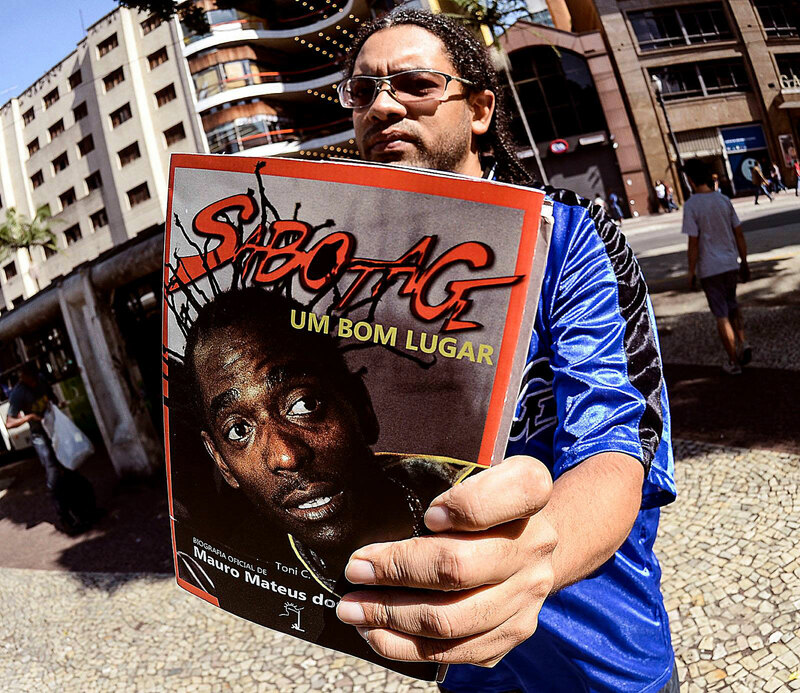 The book has the support of Itaú Cultural, the National Rap magazine, Maurício Grabois and Sumemo Wear. Mauro Mateus dos Santos, better known as Sabotage, is a rare artist who gathers a combination of fluid lyrics and finesse often articulating his raw and real experiences living in a rough favela, on the napkins of local bars. On the same napkins he would have his insights, compose his lyrics and see his verses and ideas take shape. Son of Dona Ivonete and Seu Júlio, younger bother to Paulinho and Deda. Married to Dalva, Mauro had three children: Wanderson, from his first relationship, Tamires and Larissa. He preferred words to the soccer ball, typical preference from the kids from Canão, the favela where he grew up. Hi ability to verbally express through the pen, shaped his life albeit he lived amongst criminals and fame, obliteration and success, living the life of an actor and supporting role of himself. Rap é Compromisso, de 2001, is a milestone. As much as Chico Science and Mamonas Assassinas, he only had 01 solo record. Still, he is one of the most influential figures of the Hip-Hop scenes in Brazil. He was able to mix Rap with Samba, Rock, Electronic music and recorded alongside to Charlie Brown Jr., Sepultura, Thaíde, RZO, Black Alien, BNegão, Rappin Hood, amongst others. He acted on films such as O Invasor and Carandiru and collected prizes. He was violently murdered in 2003 at the hight of his career. 10 years later he is back in movies, cartoons, news articles and in this biography, just to prove a sentence he used to say true “ Compromisso Rap é , não é viagem”!